Okay. Five. Because I can’t think of 10. I’m sure there are 10, but that was so last year! 5. 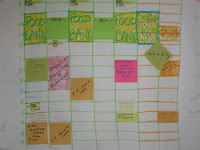 Sorting out Jessie’s schedule for this term. Given that she isn’t in school, “term” might not be the correct (a-hem) term. But since she is taking her first college course (Introduction to Public Relations), “term” might just work. As usual, she is busy. And she is always taking on new projects—such as offering to write articles for the local Down Syndrome Association Newsletter (she sits on the Board), co-spearheading a DS youth advocacy group, and speaking in schools about disability and inclusion . I get to help schedule and then nag her about fulfilling her commitments. I am going to try to give that up for the new year, so I should have more time to blog! 4. A road trip to Kingston. Where Propeller Dance participated in the first annual Able Artists Forum—performing, presenting an overview of their work to other artists, and meeting other artists with a range of abilities. Jessie is a natural schmoozer, but I am having to teach her how to collect business cards and other contact information so she can keep in touch with other artists (or even collaborate!) The highlight, in addition to the hotel and the continental breakfasts, was a chance to talk to Katherine Porter, the powerhouse over at H’Art Kingston, who has started an inclusive post-secondary program with Queens University . We will be back to pick her brain! 3. Speaking, advocating, and more speaking. It was our first Christmas without Grumps, my Dad. It was a bittersweet time. It was also a time filled with abundance—in sugar, in friends, in presents, in music, in grace. I followed our minister’s instructions and refused to feel guilty about this abundance, but instead gave myself time to enjoy. 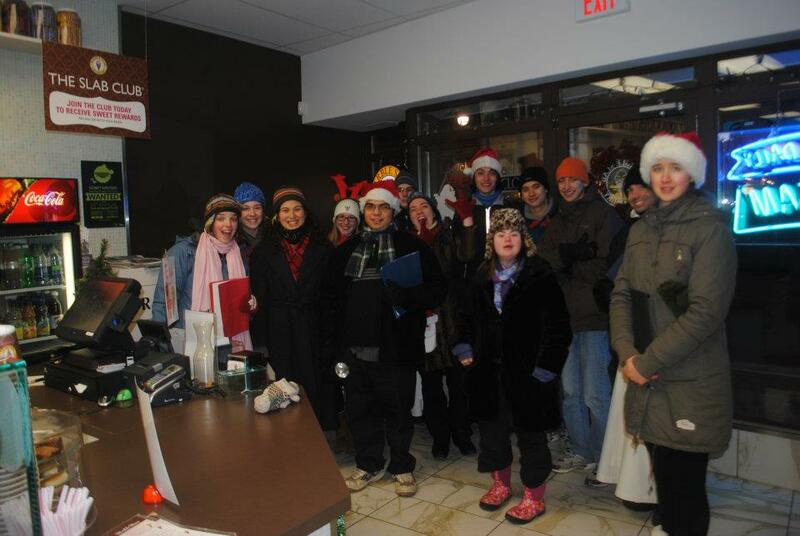 This photo is of Jessie out with the annual carolling group gathered together by her friend Rebecca, this year they collected more than $500 for youth mental health. 1. 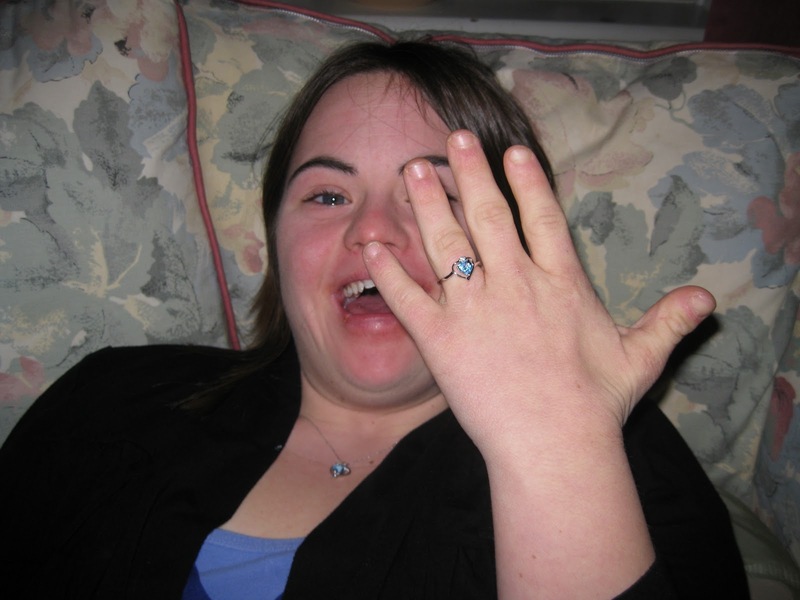 And the number one reason (drum roll): Drummer Boy and Jessie gave each other promise rings for Christmas. They spend a lot of time writing lyrics, planning their future together, and snogging on the couch. This is how Jessie would spend all of her time if she had a choice. So, much of what is happening in Jessie’s life I can’t write about and respect her privacy. I am, however, keeping a secret notebook that has to do with all those things they didn’t prepare you for when your son or daughter was born, like I mean REALLY didn’t prepare you for, not even when you got the guide book for Holland! Well, I guess maybe if Emily Perl Kingsley had written a section on Amsterdam you might find it, but she didn’t. So here we are, in a new place, without GPS. Or at least the GPS we have seems to be sending us off what appears to be a cliff. While we all dream of a loving relationship for our sons and daughters, the reality—of parent-to-parent (i.e., the parents of boy- or girl-friend) conversations about sexuality; overheard discussions and negotiations in the back of the car when driving the couple to dates or home again; and discussions about progressing through different stages (what stages? I had to go look up the bases again on the internet, and I hope no one is tracking my online behaviour)—is bit more messy (and funny and frustrating) than anything I could ever have dreamed up. 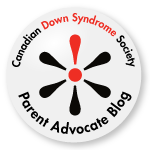 Especially since Drummer Boy attended a sexuality workshop at the Canadian Down Syndrome Society annual conference and is, therefore, the expert on all things sexual. I am so glad you blog. Even if it is just once an a while. Why? Because Ella is getting to the age where parents don't have time to blog anymore and so you don't really know what's coming...but you have given a glimpse. And WOW! The things they don't tell you in "Babies with Down Syndrome" Or at that genetic specialist appointment or anywhere else. It is encouraging and scary all at the same time! Be more encouraged than scared! Really! The best part is (aside from those glorious oh yes moments, when she is so Jessie, so herself) the people you get to meet! Oh yea! Just reading your list of 5 things, Nan. Introduction to Public Relations! Great course, that one. And it does have lots of opportunities, many for credit. (The article about Jessie's Plan was great - it's good to be able to feed and prime people, which is what Public Relations are all about). (Quarter or semester might be the correct terms). Card holders are really good, and I see "Clean Purse" was on the schedule. Reading more about H'Art's opportunity. Great collections for youth Mental Health. The carols would have given a lot of food for thought. The sexuality workshops would have been very popular. And necessary. Promise rings are very classy! (The Mama Kaz posts tided many of your readers over, as did that "Jumping over the Edge" post). Thanks AD, for saying that last posts tided readers over. Jess will love that you think the promise rings classy. That aquamarine/tourmaline sparkle on Jess's hand! Wanted to send you an awesome blog about a young lady who is doing Introduction to Acting at the University of Vermont. (Those who are fans of The Nanny might enjoy the script Stirling made in November 2011). Thanks so much for this link! Its great! How do you find these things! I think Jess will love reading it. With a name like Stirling Peebles she HAS to be in movies! somehow! Absolutely . . . although I am having a hard time keeping up! WOW - this is quite exciting!